Many readers assume that my photo for the Deck Project for each week is the “best” photo from that week, while sometimes this might be true, it is not always so. The photo I choose is usually one that can, by itself, make a contribution to the 52 photos that comprise the Deck Project, and it can often have meaning or relevance as a photo to myself more than to readers / viewers. 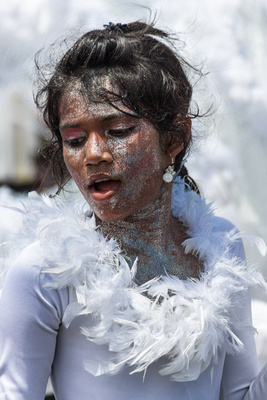 This photo that I chose for this week may very well fall into that category of not necessarily being the best, but to me it stood out among others from the Children’s Mashramani Parade, this young lady had lots of energy and I liked how her darker skin contrasted with the white costume, and how the touches of coloured glitter accented ever so slightly the celebratory nature of the event. She was part of the Smalta sponsored band from Chateau Margot Primary School, their main costume was depicting their theme “Princess of Peace and Purity” which they entered in the Ages 8-10 Fantasy Category. This young lady was not the “Princess” or the main costume, she was one of the banner or standard bearers at the front of the “band”. For a Small selection of the Images from the Children’s Mash Parade, check the Children’s Mash 2014 Select album.